In Part I of this blog series, we examined some of the practical issues with the use of standard normative data for providing context for advertising research. While having the global databases and expertise to provide traditional database averages as the situation warrants, MSW●ARS also offers approaches to the question of context that avoid the issues which plague traditional norms, providing more meaningful points of comparison that decision-makers can rely on with confidence. Loyalty: In any given category, some consumers are, to varying degrees, susceptible to switching brands. In general, the more consumers susceptible to switching brands, the higher the sales effectiveness of advertising in that category. Number of Brands: Categories differ in terms of the number of competing brands. More brands mean more competition for non-loyal consumers, which results in a lower expected level of advertising’s sales effectiveness. 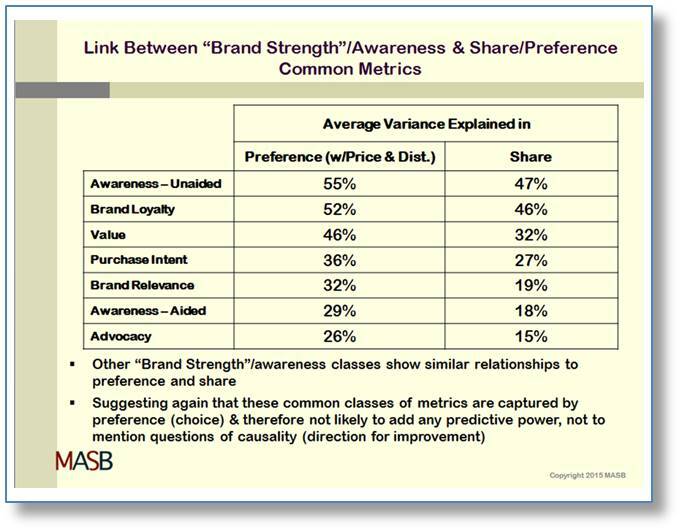 Brand Strength: The larger a brand’s share, the smaller the pool of non-loyal consumers available to switch their preference to that brand and the more difficult it is to achieve a given increase in brand preference. Availability – While category averages depend on the availability of sufficient relevant historical data, Fair Share is always available even for new or emerging categories since the inputs are a product of the testing system itself. Consistency – Category averages can be influenced by methodological differences between the current test and historical testing. Fair Share always reflects the brand’s specific test situation by only using information from that brand’s testing as inputs to the model. Representation – Category averages can vary greatly depending on what brands are included in or missing from the normative data set. On the other hand, Fair Share is stable since its inputs have been proven to be reliable in their collection. Plus, the model has been derived on and refined from tens of thousands of cases for brands in nearly every conceivable situation and so can be applied to any brand with confidence that the benchmark is appropriate. Brand Development – Category averages provide a single normative level for all brands, despite the fact that different brands can and do have very different situations that affect the potential strength of their advertising. In contrast, Fair Share is always based on current marketplace conditions and the brand’s specific position in the category. So each brand has its own unique benchmark level commensurate with realistic expectations for its advertising’s sales effectiveness. How do we know that a brand’s Fair Share level is truly “fair”? 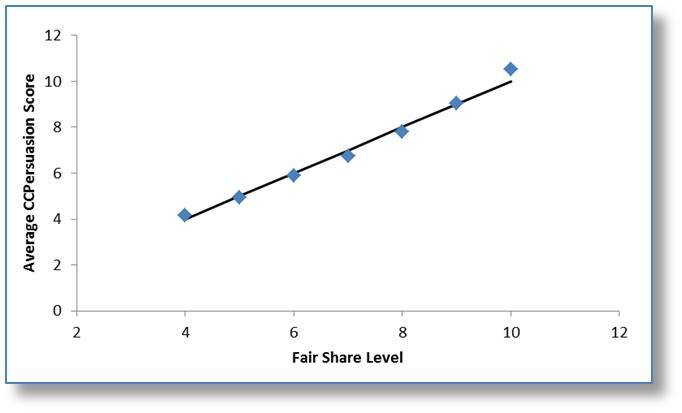 Fair Share levels are closely monitored over time to ensure that average levels closely match average CCPersuasion level. 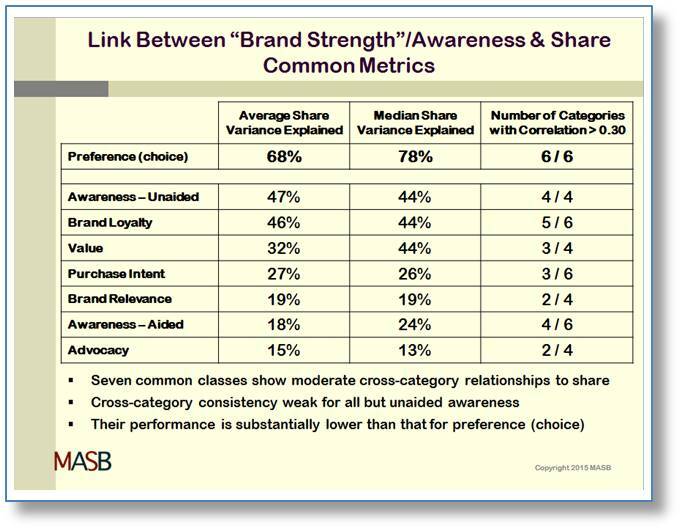 Furthermore, Fair Share explains 64% of the variance in CCPersuasion results across brands and categories, indicating that it effectively reflects each brand’s unique situation. MSW●ARS pioneered this modeled normative approach and has unsurpassed expertise and systems in place to assure that the Fair Share benchmark continues to be the gold standard in the communications research industry. When it comes to looking for insight into what is driving an ad’s performance, it is typical to look at diagnostic metrics in relation to historical normative averages and assume that those elements eclipsing normative levels must be driving an ad’s success. However given the issues with category averages, these assumptions can be erroneous. This leads us back to the second way a metric can be considered meaningful – that being, it is specifically related to the brand or category in such a way as to guide revisions or future developmental work. However, most common metrics for which normative data is typically available are too general to provide specific guidance to the brand, while those attributes and equities directly relevant to the brand or category often lack robust normative data sets. A contextualization approach which would provide meaningful feedback needs to be inclusive of all diagnostic elements which a brand considers important enough to include in its communications testing research initiatives. As with Fair Share, the MSW●ARS approach is to assess attitudinal metrics using context derived from the testing methodology itself, allowing for application to all diagnostic elements included in the survey. This approach is possible within the MSW●ARS Touchpoint methodology since both CCPersuasion and attitudinal metrics are collected from the same sample. This allows us to analyze attitudinal measure performance between those study participants who changed brand preferences and those who did not change their preference after exposure to advertising. This makes it possible to derive the importance of each attitudinal factor in the actual performance of the piece of copy or campaign. As with Fair Share, this Derived Importance approach obviates the availability, consistency, representation and brand development issues associated with traditional norms due to the assessment of importance being internal to the methodology of a single communications research survey for that specific brand. 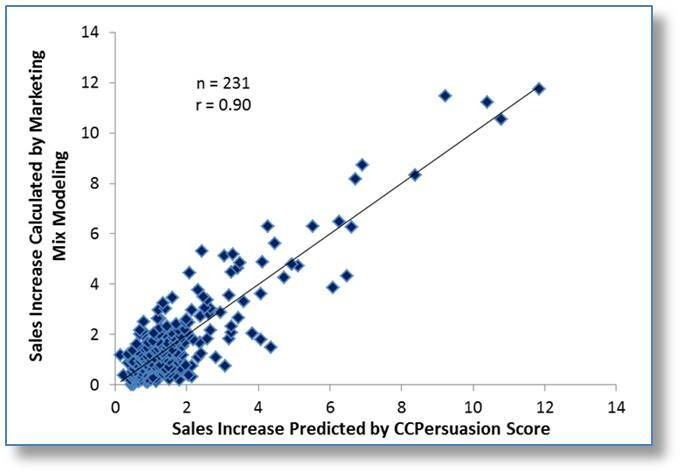 Furthermore, the results are both complete in scope and meaningful since all metrics are covered and the assessment of importance is based on preference change from the CCPersuasion metric which we have seen is strongly tied to in-market sales performance. Furthermore, the importance of each attribute can be crossed with attribute performance levels. Such a plot, as in the example below, can reveal areas of important strengths as well as, most vitally, perspective on potential areas for improvement that a brand can use to guide revisions to copy or as input to future initiative development. As parents, we need to know how are children are doing as we attempt to help them develop and fulfill their potential. In doing so, we depend on benchmarking to academic, developmental and societal norms to help us understand how they are doing. Similarly, as marketers we are concerned with developing our brand’s potential and need appropriate context to ensure our communications initiatives are delivering all the support our brands deserve. In each case, it is imperative that context is meaningful, relevant and unbiased to avoid taking misguided or even detrimental actions. To learn more about the MSW●ARS approach to providing appropriate context to your brand’s communications research results, please contact your MSW●ARS representative. Context is important. Consider the story of little Johnny, just returned from school with a test paper for his father to sign. “Hi Dad, could you please sign this for me,” Johnny said uncertainly, handing the paper to his father. “Oh, not bad then,” Dad smiled. “Hmm,” said Dad as he handed back the signed paper and slowly walked away, puzzling over whether Johnny really had performed acceptably on this test or whether it really even mattered. While this scenario may seem slightly bizarre, it highlights the importance of context in evaluating performance, and reflects on some troubling issues plaguing the communications research industry in the provision of benchmarks to put research results in proper context for making crucial decisions for a brand’s communication strategy. We may be comforted to know that our new advertisement is performing “at norm” when tested, but how can we be confident that a benchmark provided by our research supplier is truly relevant for our brand? Unfortunately it may not be, since traditional norms – typically category or industry averages – are affected by a variety of issues which may render them inappropriate or even misleading. Representation: A benchmark can only be as strong as its representation. The average of the three students who took the math test is not likely to be representative of the average ability of all 25 students in the class. A norm computed for a particular category is likely to be composed of whatever the research supplier has at hand, rather than a representation of the category as a whole. And composition can clearly make a difference in practice. Take for example average MSW●ARS CCPersuasion scores for four major brands in the same household products category, as shown in the following chart. The average scores between the brands vary considerably. The average across all four brands is 7.7. However as the graphic illustrates, excluding either the strongest scoring or weakest scoring brand can dramatically affect the overall average. The answer to ‘how are we doing’ for Brand A would be considerably different based on the presence or absence of brands B or D in the normative computations. Brand Development: We likely wouldn’t hold Johnny to the same standard as Joey DaBrain when it comes to results on a math test. Children have unique strengths and should be treated accordingly. The same is true for brands. 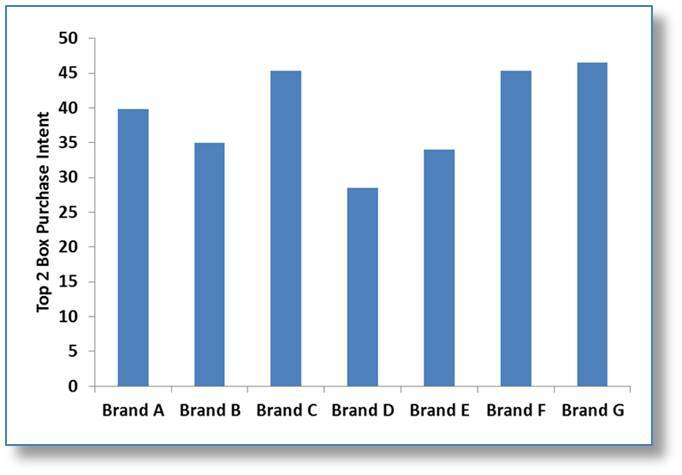 Even if a benchmark were to account for all brands in a given category, it is not a given that this benchmark would then be appropriate for application to research results for all brands in the category. This is because brands have unique situations that should be accounted for in assessing effectiveness of commercial communications. A brand team with a new entry to the category shouldn’t necessarily be held to the same standard as the category leader. As an example, the variation in purchase intent levels for seven different brands in a personal care category shows how a one-size-fits-all approach to normative data will give a misleading result for many brands. Consistency: We may attempt to expand the context for understanding Johnny’s test result by considering the class next door, which recently had a test on fractions. However the results for the other class are obviously affected by the teacher’s choice of questions and typical difficultly level of his or her tests. When it comes to normative data, similar considerations are also in play. If we are considering a verbal metric, results could potentially be affected by such factors as question wording, type of scale used, placement within the questionnaire and sample group considered. 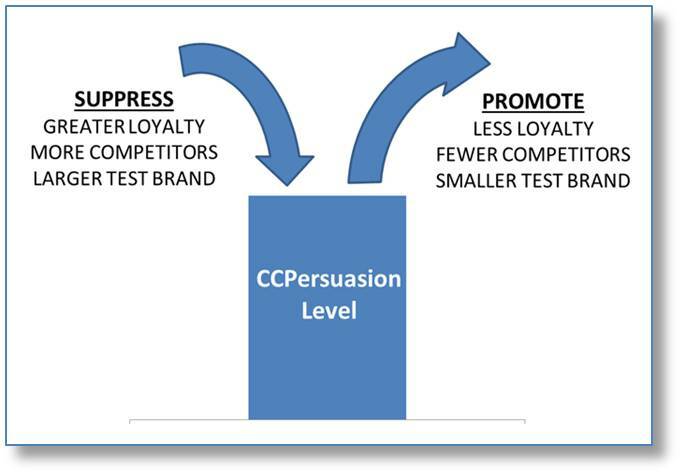 Even for a behavioral metric with a consistent and rigorously monitored methodology such as CCPersuasion, there can be differences in how brands in the same category define their competitive brand set, particularly in categories that are somewhat ambiguous or can be defined more broadly or narrowly. Such differences may again make comparisons to category averages less meaningful than first presumed. Availability: In some cases, particularly in new or emerging categories, it may be difficult or impossible to formulate normative data for a specific category or even broader industry segment. Or for smaller categories, it may be necessary to reach far back in time to assemble sufficient cases, leaving the resulting norms susceptible to changes in market conditions, consumer sentiment or research methods. Scope: A category norm requires historical test results for the metric of interest across a reasonably robust number of brands and overall cases. So by definition, such a metric will need to be general enough to be in broad use in the research industry. This will include common metrics such as liking, purchase intent, awareness and so forth. 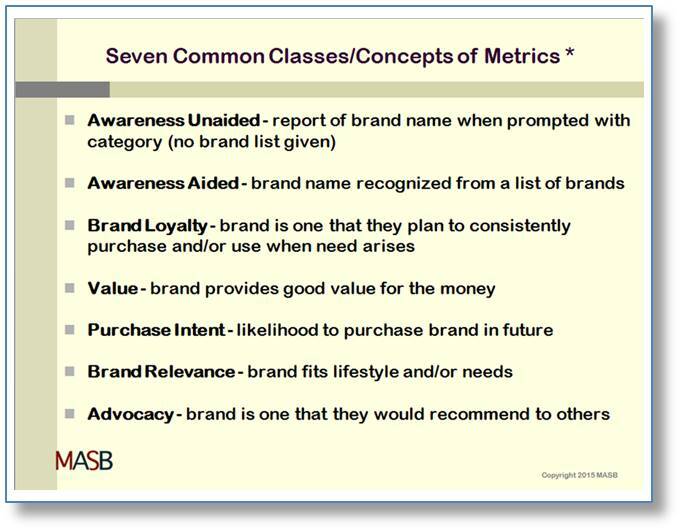 While benchmarks may be readily available for these metrics, this likely will not be the case for many of the brand-specific metrics that the brand team is particularly interested in, which leads to the last and perhaps most important issue with normative data – meaningfulness. Meaningfulness: Beyond the appropriateness of the “class average” of 75 as a benchmark for Johnny’s performance on the math test, perhaps the larger issue was whether the test result was at all meaningful in predicting Johnny’s success in the course, given that it was likely a make-work exercise for the students not participating in the class trip. Similarly, while much effort may go into providing normative benchmarks for a battery of standard metrics, are the resulting comparisons useful to the brand? Despite these issues, research managers desire context for their research results – and rightly so, as context is imperative. Part II of this series will highlight approaches pioneered by MSW●ARS that provide appropriate context for research results while avoiding the pitfalls which beset standard normative data. Please contact your MSW●ARS representative to learn more. In Part I of this blog series we discussed ten technical characteristics of brand preference which made it suitable for adoption into market research tools. But just because something can be done doesn’t mean it should be done. In fact, one of the issues identified early on by Marketing Accountability Standards Board (MASB) was that the sheer number of metrics in use could lead to a type of analytical paralysis; that is, an inability of insights groups to efficiently advise other functions of the organization. This has been euphemistically referred to within the group as “swimming in data”. Given MASB’s focus this primarily revolved around the plethora of metrics being applied to quantify the overall financial success of marketing activities. 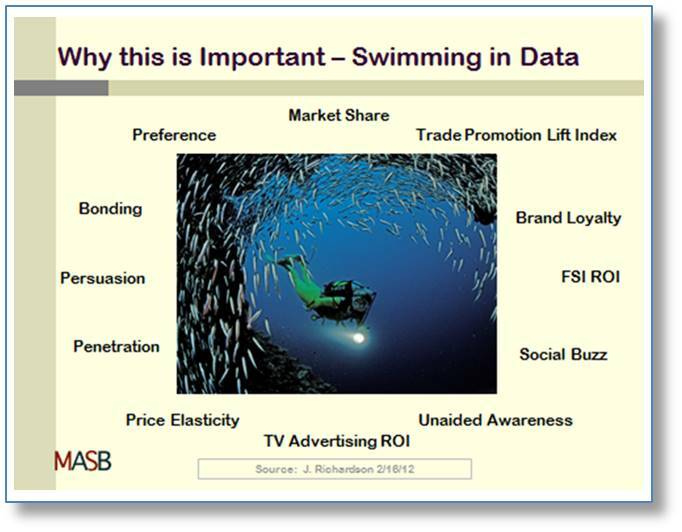 But from our experience addressing this “swimming in data” issue is even more urgent for tactical research applications, especially brand tracking. It is not uncommon to see between fifty and one hundred different category and brand attributes being monitored. Each of these attributes captures a dimension of “equity” deemed important for brand success. But how does an analyst combine these metrics to quantify the total health of the brand? 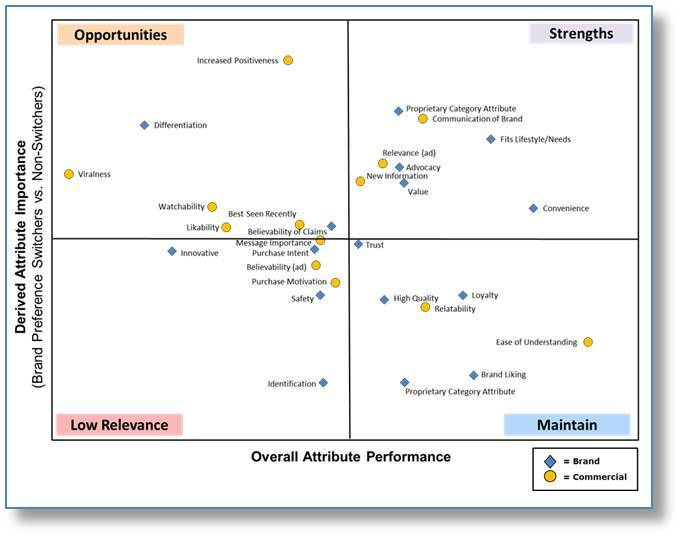 One popular approach is to apply structural modeling of the attributes versus sales data. The resulting model provides a means of “rolling up” attributes into one number. However, there are several challenges with this approach. One is that such a model often becomes viewed as ‘black box’ by other functional areas. This lack of transparency and simplicity fuels distrust and slows down adoption of insights. But even worse is that such a model is only applicable to the environment in which it is derived. Technological, financial, and even style trends can dramatically change the relative importance of attributes within a category thus uncoupling the model’s link to sales. For example, being viewed as ‘having fuel efficient models’ is much more important for an auto brand when gas prices are high than when they are low. Brand preference offers a better approach to the “swimming in data” issue. As a truly holistic measure it captures the influence of all these attributes. This was confirmed in the MASB Brand Investment and Valuation project. 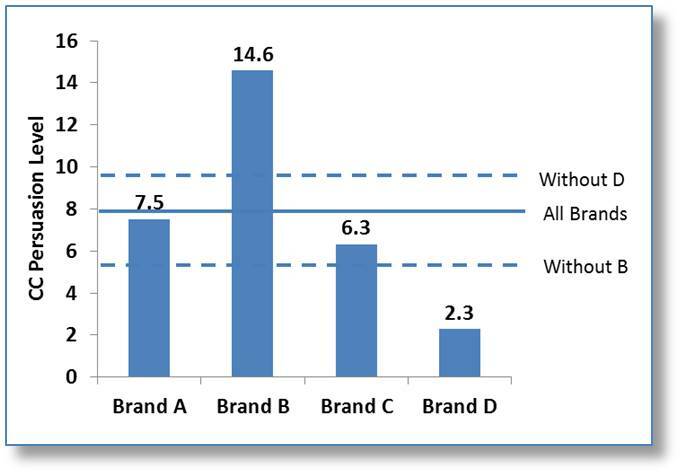 Several of the marketers participating in the brand preference tracking trials provided equity data from their internal tracking programs for comparison purposes. Across the categories investigated there were seven other brand strength ‘concepts’ commonly used. A correlation analysis was used to contrast their relationship to changes in brand share of market versus that of brand preference. What was found is that the strength of their relationships to share varied by category and oftentimes fell below the correlation level deemed moderately strong by Cohen’s Convention (Jacob Cohen, Statistical Power Analysis for the Behavioral Sciences; 1988). Furthermore, all of these other metrics exhibited correlations to market share substantially below that of brand preference. But brand preference didn’t just demonstrate stronger relationships to market share than these other measures, it also captured their individual predictive power. This is most readily seen by contrasting each measure’s explanatory power of preference to that of market share. All seven measures exhibit a stronger relationship to preference than to market share. Given that the preference was gathered on a completely different sample than the other measures, this strongly suggests that the explanatory power of these other measures is acting through preference in explaining market share. In addition to these seven common concepts, category specific attributes were also examined. Of the seventy metrics examined not a single one showed potential to substantially add to the predictive power of preference. Probably the most extreme example of the advantage of brand preference as a holistic tracking measure comes during a product safety recall. During these situations it is not unusual to see top-of-mind awareness levels peak near one hundred percent. At the same time, brand attributes such as safety and trust which typically show milder importance rise to the top. Under these conditions a structural model’s ability to explain sales may not just drop to zero but actually turn negative. That is, it will report brand strength rising even as sales precipitously drop! Since brand preference not only captures the changing level but also the changing importance of these other dimensions, it remains a valuable tool for navigating such times at it will accurately monitor progress in rebuilding the brand in the hearts and minds of consumers. The Tylenol tampering incident illustrates this. As the nation watched several people die from the poisoning, brand preference plummeted thirty-two points. The Tylenol brand could no longer be trusted. 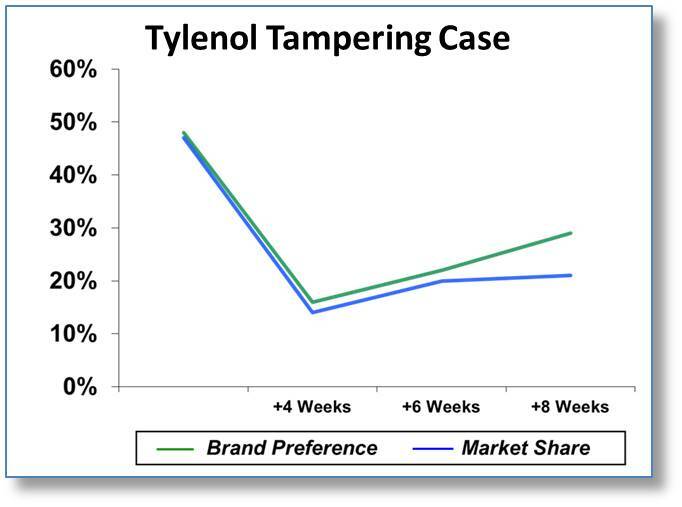 Concurrent with this brand preference drop, Tylenol’s market share fell thirty-three points. As Johnson & Johnson addressed the situation responsibly, the brand’s previous place in the minds of consumers was slowly rebuilt. This set the stage for a rebound in brand sales as tamper protected versions of the brand’s products made their way onto store shelves. Because of its ability to accurately monitor the total health of a brand, the MSW●ARS Brand Preference measure is quickly becoming viewed as the ‘King of Key Performance Indicators’. But there are other very pragmatic reasons for incorporating it into your tracking and other research. In future blog posts we will discuss these and how easy it is to do. Please contact your MSW●ARS representative to learn more about our brand preference approach. Do Your Events Energize Your Brand? Has The Great Recession impacted the customer experience?